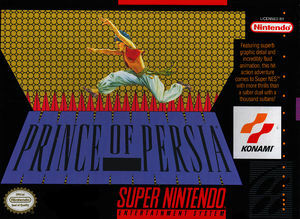 The award winning computer software adventure that has people everywhere rattling their sabers, Prince of Persia, is here for Super NES. And now the animation is more detailed, and the controls more responsive. There's even a five part training mode for sharpening your running, jumping, climbing and sword fighting skills. But the sands of time are against you. For you must survive 20 perilous stages, rescure the princess from the evil Grand Vizier Jaffar, and claim the royal residency all before the hourglass is empty. Beware the unpredictable floors and ceilings, gut splitting guillotines, hidden spikes, walls of flames and more. Jaffar's spells spell doom if you're not crafty and nimble. And a legion of savage servants, amazing amazons and immortal skeletons will do his barbaric bidding. Even your own alter ego is the enemy. Pass through invisible doors and walk through space portals. Find vessels of magic potions, but partake of them wisely. They may increase your life or just as easily poison you. So take each step with caution, young would-be prince, or the entire kingdom will suffer the darkest Arabian night ever. The graph below charts the compatibility with Prince of Persia since Dolphin's 2.0 release, listing revisions only where a compatibility change occurred. This page was last edited on 20 December 2017, at 04:35.